In the 58 years since its publication, Crockett Johnson’s Harold and the Purple Crayon has appeared in 14 languages, and inspired many artists. This blog (which takes its name from a line in the book) presented The Purple Crayon’s Legacy, Part I: Comics & Cartoons… nearly three years ago. It is at last time for Part II: Picture Books. As Harold does, Bear goes for a walk. As Harold does, Bear carries something to write with (a pencil instead of a crayon). And, as is the case with Harold, what Bear draws becomes real. It’s true that, graphically, this is a very different book. Browne’s jungle scenes — all in color — recalls those of Henri Rousseau. Also, where Harold both creates and solves his problems, Bear’s problems — two hunters who want to shoot him — are not imagined. Fortunately, his pencil proves more powerful than their guns. I’m tempted to say that, in the book, the power to imagine a better reality trumps the power to kill. 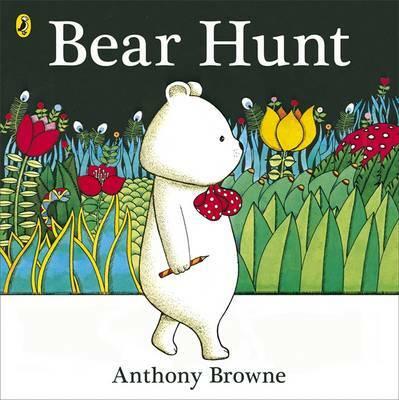 However, Browne handles this story with such a light touch that, while it may suggest such morals, that’s not the focus. Felix Clousseau’s art looks ordinary, but it’s not. His painting of a duck actually quacks. However, “that was only half of it,” observes Agee’s narrator as the duck leaves the painting. 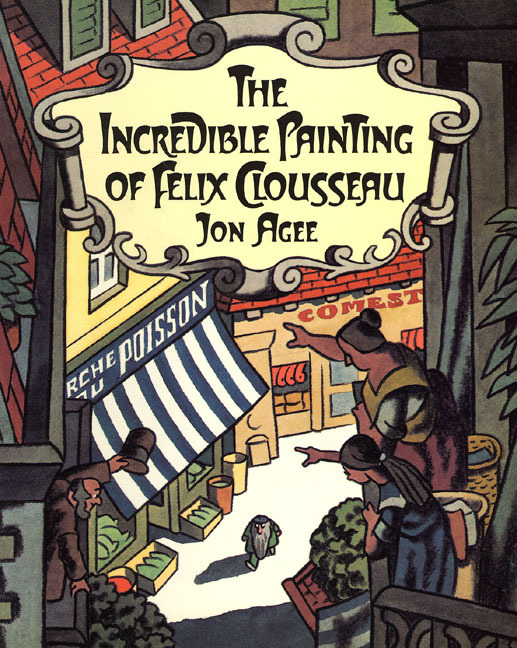 This is one of the book’s sly jokes (if it walks like a duck and quacks like a duck…), which include comic names of rival painters (such as Felicien CaffayOllay), several Magritte references, and the pun on the final page. No, I won’t give away the ending. Read it yourself. May of Van Allsburg’s books traverse (or blur) the line between imaginary and real, but Bad Day at Riverbend seems the most explicit homage to Johnson’s book. 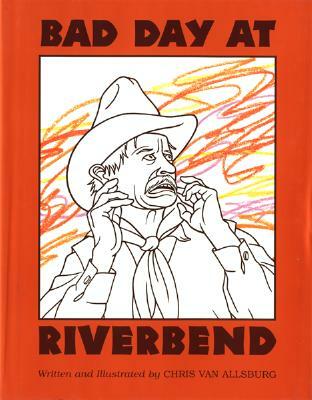 Rendered in coloring-book style, the people of Riverbend face a “greasy slime” that sticks aggressively to whatever it assaults. We readers recognize the “slime” as crayon scribbles, which (spoiler alert!) the book’s ending reveals to be true. The townspeople are … the victims of a child with a crayon. 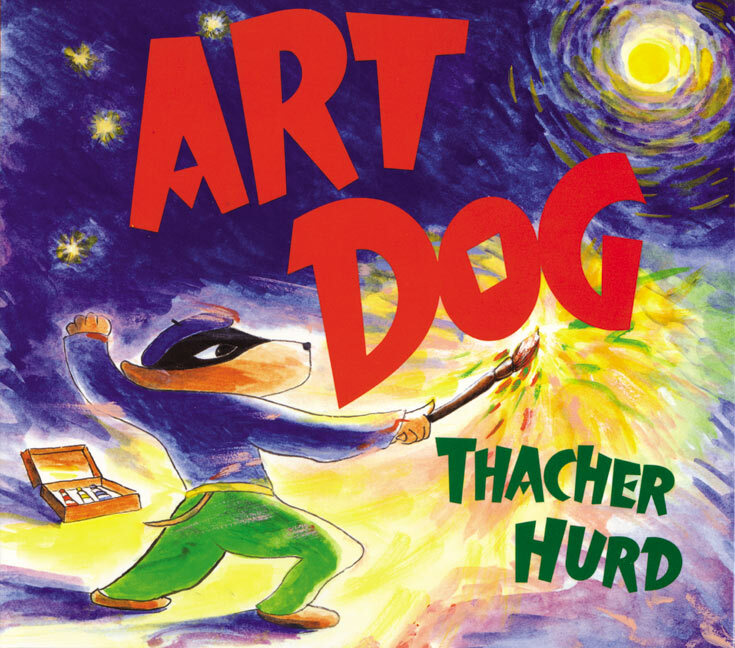 As Harold does, Art Dog creates art that changes physical realities. He also has his artistic adventures at night, beneath the moonlight. On one of the pages, he paints a somewhat goofy purple (with green spots) bird who reminds me of Harold’s drawings. Above the bird, on the wall, he has painted falling stars reminiscent of the one that Harold rides home in Harold’s Trip to the Sky (1957). Wordless (save for the occasional sound effect), Faller’s Polo books have an associative narrative logic that’s evocative of the Harold stories’ structure. In Voyage de Polo (The Adventures of Polo), he opens the door of his island tree home, walks over to a tightrope, and then starts carefully to make his way along it — shades of Harold’s tightrope act in Harold’s Circus (1959). The tightrope suddenly becomes stairs, which Polo then climbs — reminiscent of the stairs in Harold’s Fairy Tale (1957). Beyond those direct visual allusions (or, at least, they feel like allusions), the story’s art manages to link each panel to the next, and then to the next. 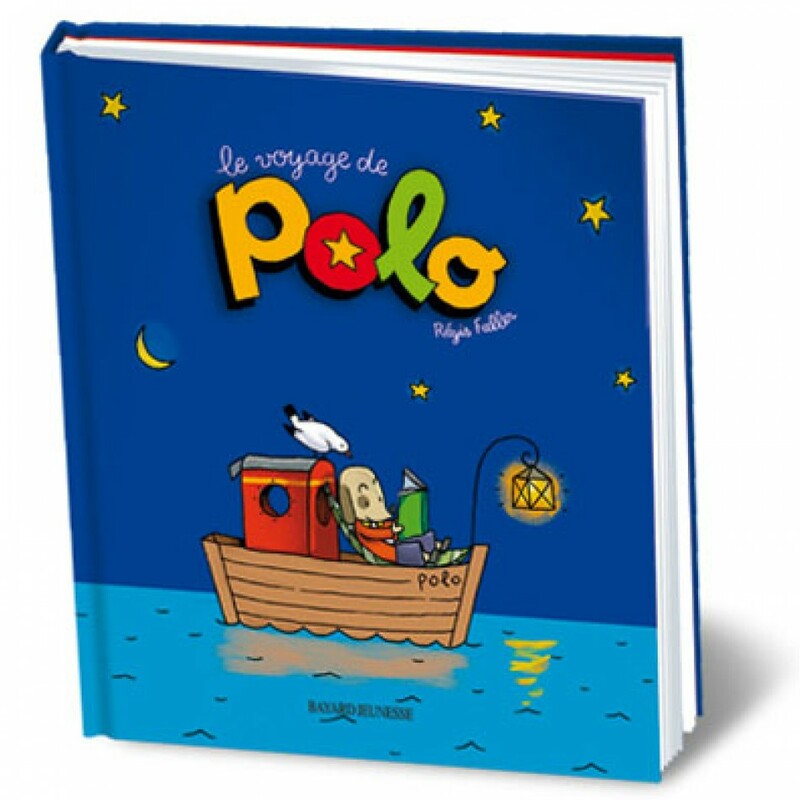 You don’t quite know where Polo is going, but he’s traveling with a purpose, and fun to accompany for the duration of his journey. More than anything else, the chain of associations most strongly reminds me of Harold’s stories. A small book that begins with “a blank page” and then waits for “the story” to get underway, Durand’s Bob & Cie. (Bob & Co.) pursues the metaphysical implications of Harold’s predicament. Except, in this story, it’s Bob’s predicament. It’s hard to summarize. By turns whimsical and profound, Durand’s absurdist metafiction is about faith, narrative, the universe, beginnings and endings. It’s one of my all-time favorite books. Someday, I’d like to write (a blog post? an essay?) about Durand’s work. Her sensibility and sense of humor appeal to me. The creator of the comic strip Mutts creates a story about a boy named Art who creates lots of art. This conceit inspires many puns on the name, and, well, lots of art (and Art). 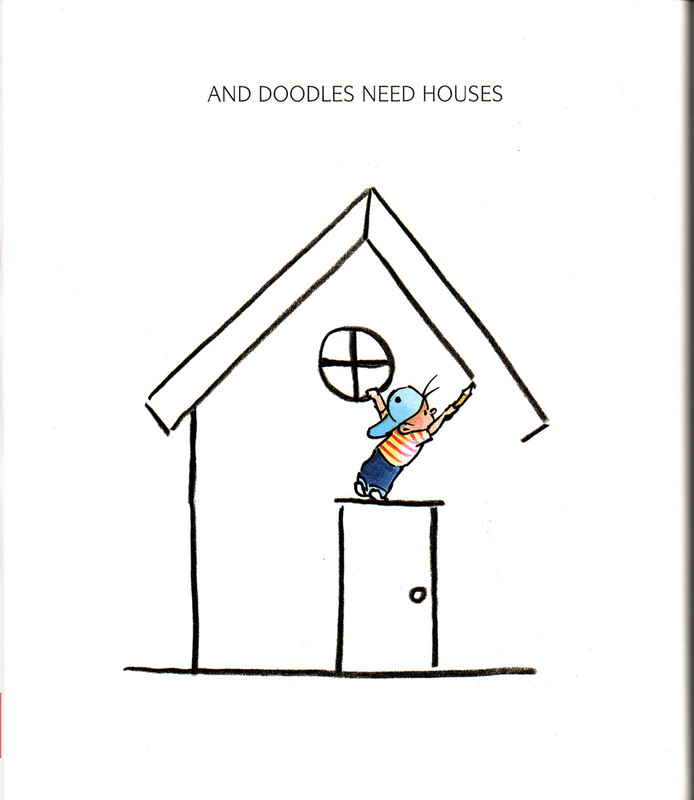 About a third of the way in, the book moves explicitly to Harold’s territory, when Art draws a house and then stands on the doorway in order to draw the roof. 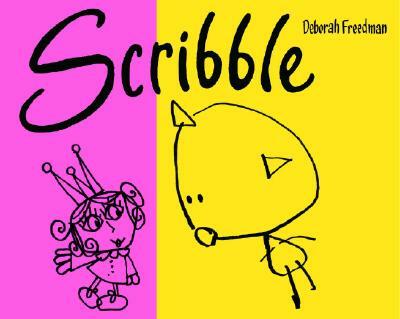 When Emma insults her younger sister Lucie’s drawing of a kitty (“It looks like a scribble”), Lucie defends herself: “It’s a special scribble-kitty!” In retaliation, she scribbles all over Emma’s drawing of the Princess Aurora. Emma storms off. Then Scribble, Lucie, and the sisters’ real cat step into the drawings — which is the moment that the book enters Harold’s realm. It’s telling that only the younger sister crosses the boundary from real to imaginary worlds. Perhaps Freedman is suggesting that only the youngest children — Lucie, Harold — can make that leap, and fully believe it. Freedman’s second book, Blue Chicken (2011), also plays with the boundary between art and life. But, this time, a chicken is the artist. 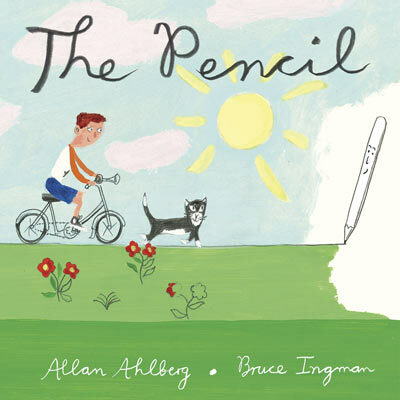 A pencil (which appears itself to have been rendered in pencil) draws a boy, a dog, a cat, a house, a road, and a park. As in Harold and the Purple Crayon, all things the pencil draws are real. The book departs from Johnson’s book when the pencil draws a paintbrush, who in turn colors everything the pencil draws. The decision to add color bends the narrative logic (how can a grey pencil draw color? ), as does the decision to add an eraser (how can an eraser remove watercolors?). But the eraser proves a valuable antagonist. Just as the pencil draws enthusiastically, so the eraser embraces his function — threatening the world that pencil and paintbrush have created. I wonder: what would have Harold done with an eraser? He does cross things out (the witch in Harold’s Fairy Tale, the whole picture in A Picture for Harold’s Room), but he never erases. The line of the hill disappears from Tommaso’s drawing, which shows “a house on a hill, / a tall tree and some mountains. / And two people — / him and his grandma.” So, of course, he goes off in search of it. On the right-hand page, Pericoli uses black ink for everything, except his character’s drawing and specific lines that Tommasso finds — those are all in orange. On the left-hand page, Pericoli places white text on an orange background. The orange at left makes each orange line at right “pop” out of the picture. Visually, it’s very effective. Sure, Tommaso is also an artist, but, you ask, is there a more particular connection to Harold and the Purple Crayon? There are several, first of which is that Tommaso does find his line — “as real as he always remembered it” — out in the world. So, as in Johnson’s book, art can become real. Also, though Pericoli’s line is not as tight as Johnson’s, the pen-and-ink drawings on white pages evoke Johnson’s aesthetic sensibility. 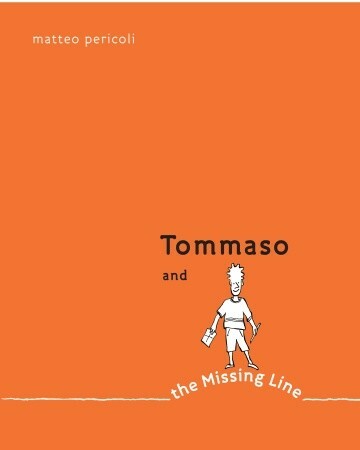 Just as Harold’s purple line does, Tommaso’s orange line has as powerful a visual presence. Any obvious (or not-so-obvious) books I’ve missed? I realize there are many other metafictional books (Scieszka and Smith’s The Stinky Cheese Man, Barbara Lehman’s The Red Book, to name but two) or aesthetically comparable books (Lehman, again, Newgarden and Cash’s Bow Wow series) or books about artists (Lionni’s Frederick, McClintock’s The Fantastic Drawings of Danielle). My list may be too narrow, but its idiosyncrasies will I hope inspire discussion. So, let the discussion begin! I bet you’ll love Aaron Becker’s _Journey_, coming this Fall. Emily Gravett’s books, especially “Wolves,” (2006) use so small amount of metafictional devices. Though often her characters are the unwitting marks, caught in a web beyond their control. This is the opposite of Harold the WorldBuilder, but in both cases the reader is asked to participate in a way that makes the physical turn of the page a plot device. Very clever stuff. Another example is Mordecai Gerstein’s “A Book” from 2006, which features a family of characters each in search of their own genre. At one point the little girl protagonist looks up directly at you the reader and is disgusted by your Brobdignagian largess. And now I’ve just stumbled on your metafiction post! So good! Thanks, Jules! You’ve recommended Journey to me already, but I appreciate the reminder. From what I could see on line, it looks like a winner — and potentially part of Harold’s legacy. Looking forward to it! JoeyC: Thanks for the suggestions. I know all the books you mention except for Alan Moore’s Promethea and Carey and Gross’s Unwritten. I like metafictional books (as you’ll have learned, from the other post), but these ones don’t have the je ne sais quoi that would make me place them in the “Harold’s Legacy” category. I would include Harold with them in a group of metafictional books. And, in fact, as I was thinking about this earlier today, I looked again at Mordecai Gerstein’s A Book and Emily Gravett’s Wolves, both of which I like very much. But, as you say, they lack the “Harold the World-builder” element — though A Book has it more than Wolves does. (In A Book she does get to choose her own story.) I opted to exclude them from this list, though both are (again, as you’ll have noted) on the metafictional list. But, thanks for the suggestions just the same! I only discovered Polo recently, and that was thanks entirely to Jules (who posted above)! Thanks, Harold! I’ve just added links for both (in your comment). Thank you! Harold was my childhood favorite and I loved reading this post. And YES, PLEASE! A post/essay on Delphine Durand. I love Bob & Co. so much that I bought five copies and thus can give it as gifts when so inclined. Thanks for the response. I see your point that “Harold’s Legacy” is all about creation–a pretty inspiring world for young readers to inhabit. I do wonder about Harold and the fact that he has no real adversary in his adventures beyond what he himself creates. So very unlike the boy in “The Carrot Seed” and his mean brother or Ellen and her doubting Lion. Even Barnaby is confronted by his parents regularly about the existence of O’Malley. Harold creates the structure, plays with it, is tripped up by it, but he doesn’t have a foil to doubt it’s power. I just found “A Picture For Harold’s Room.” In one scene, he finds himself dissatisfied with a picture of a large bird and mouse and remembers that it’s only a picture. He just crosses it out and moves away! But because he is perplexed by his size relative to the world around him, he draws himself in a mirror looking the right size just to be sure. He is comforted and ready for bed. Still, when Harold decides to draw his next picture, he is sure to give it a frame. I wonder if Johnson’s decision to give each page a “full-bleed” illustration reflects Harold’s unbounded creativity. But in this book, Harold decides in the end to create boundaries for himself nonetheless. I’m so glad to have found your blog via the niblings! I just ordered the biography of Johnson and Krauss, both characters I have been fascinated by since reading Ursula Nordstrom’s letters. Katherine Tillotson: I also buy stacks of Bob & Co., and then give them away. It’s just one of those books that everyone should have — well, all of my friends should have, at any rate. JoeyC: Love Lobel, but confess that I don’t know The Great Blueness and Other Predicaments. Thanks for the recommendation! I look forward to reading it. I know (& have) Weslandia. I like it & see the comparison you make — protagonist grows (literally grows!) a world. Doesn’t strike me as quite the same sensibility as the “Legacy of the Purple Crayon” books listed above, but I freely admit that my aesthetic criteria is rather fuzzy here. One could certainly make a case for Weslandia. I don’t know that I would, exactly, but I see why you might. You mention the full-bleed, and I agree that “unbounded creativity” is a plausible way of looking at it. Each book is essentially one giant drawing that Johnson (and Harold) reveal to us one page at a time. I think of each page as a window into this much larger artwork-in-progress. Another interesting feature is that Johnson almost never uses a full two-page spread. With the exception of the “city of windows” (4 pages in all) near the end, each single page is a different moment in time. Using the full two-page spread for the “city” pages better conveys the vastness of the city and Harold’s smallness (and lost-ness) in relation to it. It allows for different sizes of buildings (which brings in depth, moving the picture towards a three-dimensional space, away from the two-dimensional flatness these drawings offen but not always assume. It also suggests the scope of Harold’s enthusiasm: once he starts drawing those windows and those buildings, he really gets into it! I write these words en route to Winnipeg, where I am giving a talk on Harold and the Purple Crayon at a Visual/Verbal Texts Symposium, at the University of Winnipeg. So, I’ve been thinking quite a lot about the book lately! Great fun to ponder. Thanks for ordering the biography. I think Johnson and Krauss were (and are!) fascinating people (er, obviously, or I wouldn’t have written the book). Hope you enjoy it! Now I must tear my house apart looking for my Harold! Thanks??? Me too, me too! I’m also Delphine Durand fan, who loves to give away BOB & CO, and MY HOUSE. Another Harold-legacy book that I like is JEREMY DRAWS A MONSTER, by Peter McCarty. Not identical to Harold by any means, but–as far as I know–this is the first instance of interactive television, and it’s done through encouraging kids to draw themselves into the narrative. Along the same lines perhaps – Chalk, by Bill Thomson.